Balthasar van der Ast (1593/4-1657) Born in Middelburg, Zeeland. Orphaned, he lived with his sister's husband Ambrosius Bosschaert the Elder (1573-1621). The latter's three sons, all apprentice painters, became the pupils of the gifted painter Van Ast in 1621. In 1610, Ambrosius had fled from Antwerp to settle in Middelburg. Settled in Delft in 1631 (Montias states: in 1632). In Guild in 1632. Contacts with notary Willem de Langue in 1632 for whom he co-signed many documents including the one in 1640 benefiting his colleague still life flower painter Jan Baptista van Fornenburgh. Initially he painted flower pieces, later still lifes with sea shells, reflecting his interest in collections of natural history. In 1640 he sold the house on Cellebroerstraat for 500 guilders. In 1650 and 1657 he lived on Oude Delft, east side, number 144-146. 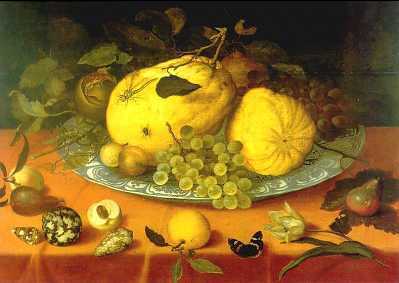 The image shown here is a Still life with fruit, now in Mauritshuis, The Hague. Known mean prices for his paintings were 39 guilders (before 1650), 5 guilders (after 1650), 16 guilders and 11 guilders (after 1680). One of his works is known to have adorned the walls of the greatest collector of paintings in Leiden, François de la Boe Sylvius (1614-1672) who lived on Rapenburg canal. François left a stunning collection of 185 paintings upon his death, including works by Gerard Dou and Frans van Mieris the Elder from whom he commissioned paintings. Note. Bol, Bosschaert (1960) 40 gives the listed years. Montias 1993, p. 89 reports he was born around 1590. Genealogische Encyclopedie I, 23 gives the house number. Ett 1975, p. 55. On 20 September 1640 Balthasar sold the house on Cellebroersteech for 500 f. (NA 1976) Private communication by Montias, 2000. See discussions in exh.cat. 'Vermeer and the Delft School', Metropolitan Museum of Art, New York City, 2001, p. 91. Launched 16 February 2009; Last update March 1, 2017. More info in the RKD site.